We got a bit of a deal on a nuc for what we will name the sun hive as the frames were being held together with frame savers. The frames had formerly been in a nine frame box and some of the honey comb was drawn out thick. One frame also had a fair bit of drone comb. All four frames were full with either brood or food, it seemed to have a very strong population of bees and we spotted a very dark queen. 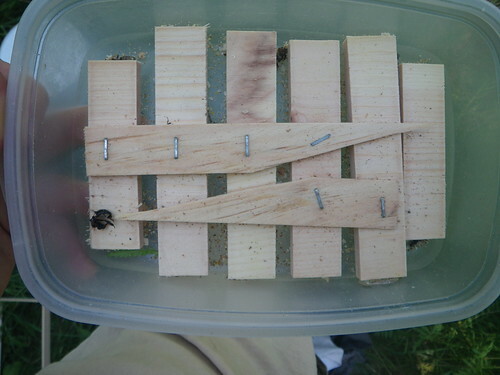 As we are not using foundation, we used a level to make sure the hive was not tilted. The idea is this helps to ensure straight comb. 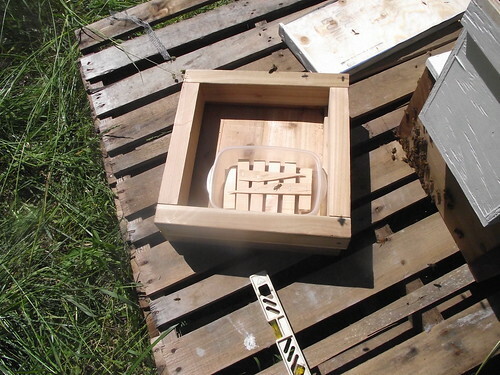 We also used an 'eke' (a small spacer box) to make room for a feeder container. We gave them about 500ml of 1:1 sugar water. We put a little wooden raft in the feed container to help prevent drowning. We placed one of our warré frames in the nuc to get them building on warré sized frames right away. Even though I had built a five-frame nuc box adapter, it was a tight fit with the thick honey combs on the lang frames. So we trimmed down one comb and let a good amount of honey pool on the bottom board. 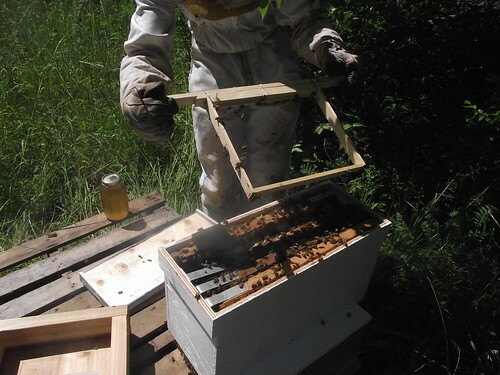 We transported the hive with the wide opening on the bottom board for maximum ventilation, but we forgot to flip it when setting up at the destination. We still added reducers to the entrance while they build up. 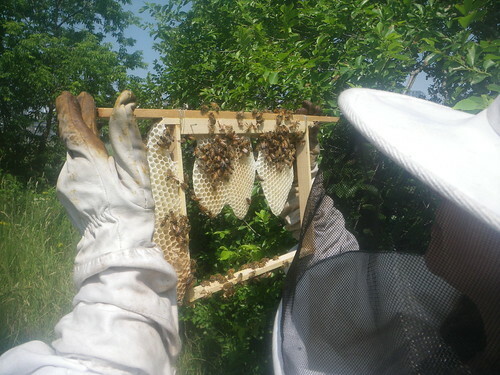 They built a fair bit on our warré frame in the nuc and we saw eggs and larvae. We cut the wires and moved it down into the warré box. We started another warré frame in the nuc for the moon hive which unexpectedly received five lang frames and didn't have space for our extra empty frame. They had cleaned up all the spilt honey and taken all the sugar water. We didn't add any more feed. The orientation flights seemed to have ended, and we saw a steady arrival of orange as well as pale yellow pollen coming in. 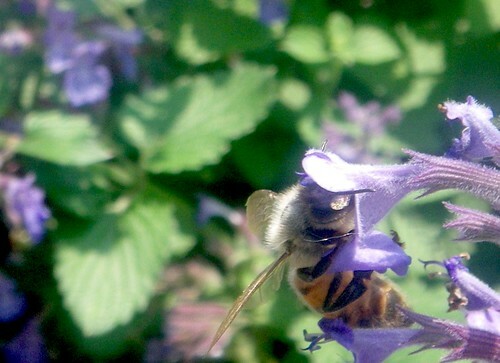 We also noticed honey bees on mint not too far away. With this in mind we decided to see how they will do with just the natural forage. 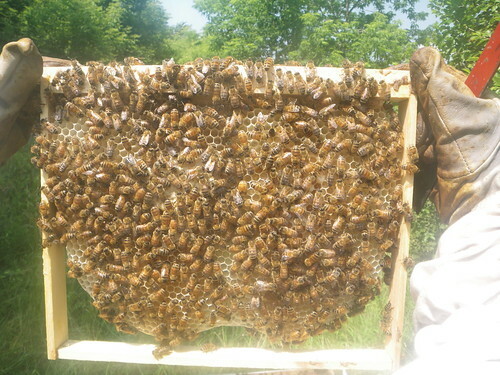 That frame continues to fill out nicely and even contains some capped brood. They also started two more combs on either side of this frame. Hooray! One frame had three distinct comb segments, with the one in the middle veering perpendicular to the frame. We had to trim it down very slightly, but were able to bend it back straight without doing much damage. We then put it between the other two started frames. These combs had every last available cell full of eggs or some food. We also spotted our queen down here. 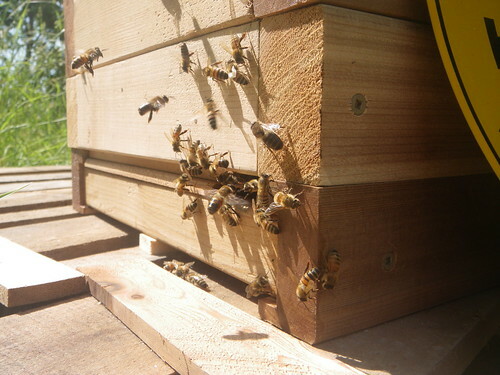 Up in the nuc box, the frame for the moon hive had been started and contained eggs. We took it out and gave it to the moon, leaving just the 4 lang frames in the nuc box. This post has been incredibly helpful to me - I'm in the same situation (Lang to Warre) and working my way through it. Thanks so much for posting this! Thanks Graham. Look forward to hearing how your hive transition goes. BTW, I've just updated the lang to warré transition box page with one of the slight changes in approach that I've made this year.